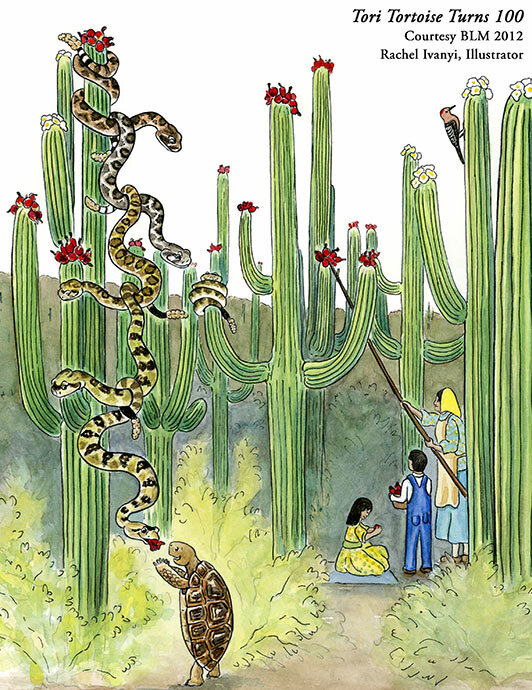 "Tori in a Saguaro Fruit Harvest"
Copyright © 2012 DOI, Bureau of Land Management Arizona. This image is not available for reuse and is protected by copyright. Rachel Ivanyi, AFC Description“Tori Tortoise Turns 100” has been designated by the State of Arizona Historical Advisory Commission as an official Arizona Centennial Legacy Project, as commissioned by the Arizona Legislature. The book is available as a download, and at your local library.